The Sina Tech news blog reported earlier today that Baidu, China's home-grown version of Google, now own about 40% of Fan Shu, maker of the Yambook ebook reader. Details haven't been confirmed, but the deal is reportedly worth 47.6 million yuan ($7.4 million USB). Fan Shu have a number of different Yambook models on the Chinese market, with specs ranging from Wifi to 3G. They also have their own ebookstore as well as a PC and Android reading apps. The Baidu deal would value Fan Shu at 120 million yuan. IMO this rumor is very likely true. A couple weeks ago Baidu signed a distribution agreement with a number of Chinese publishers that gave Baidu the right to sell their ebooks. The deal legitimized Baidu's Wenku books portal, which had previously been accused of wide-spread piracy. Baidu are clearly making a push into ebooks. Buying Fan Shu would be a good way to bring the new content to market in the minimum time. Does it use an eInk screen or non-backlit LCD? Now we can account for eInk sales skyrocketing each year, if so. Aha! So several million have been selling in China via various companies. Well, no. 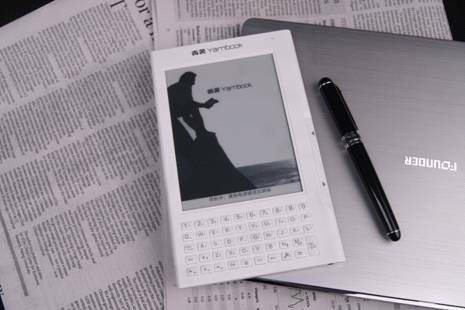 The Chinese E-ink e-reader market is supposed to be under a million devices a year.